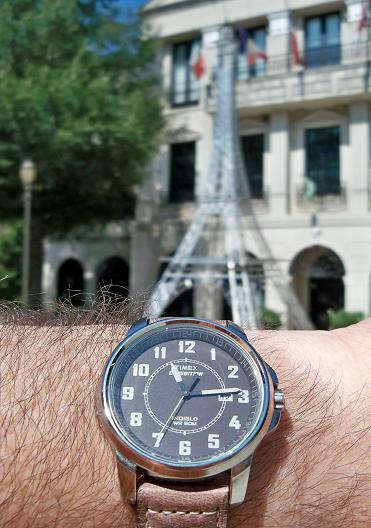 The Timex Expedition brand evokes action and adventure. 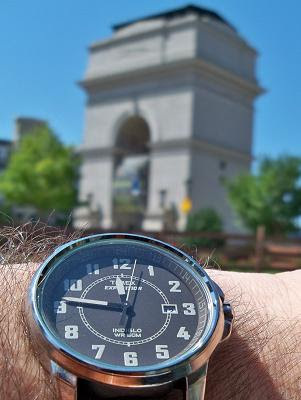 My Timex Expedition Vintage Metal Field Watch evokes the greatest generation, World War II, and the greatest crusade. It seems like a bit of a shame to wear a Timex Expedition around the house. So, one Saturday morning, I decided to liberate Europe by finding local landmarks with European flair! First, I marched on Paris - or at least a French boutique - where I found this miniature Eiffel Tower. Then, with victory in hand, my mechanized unit moved like lightning to find our local Arc de Triomphe. I call it, the Arc de Whatever. Atlanta actually calls it the Millenium Gate.